Yesterday my wife decided to buy yet another sewing pattern book and I decided to tag along. As a Kindle user, there’s usually very little for me to do at a bookstore. I usually just look around the IT section of the magazine rack and thumb through the amazing Ubuntu magazine, or Nikkei Linux. This time though, a magazine called “Otona no Kagaku” caught my eye. 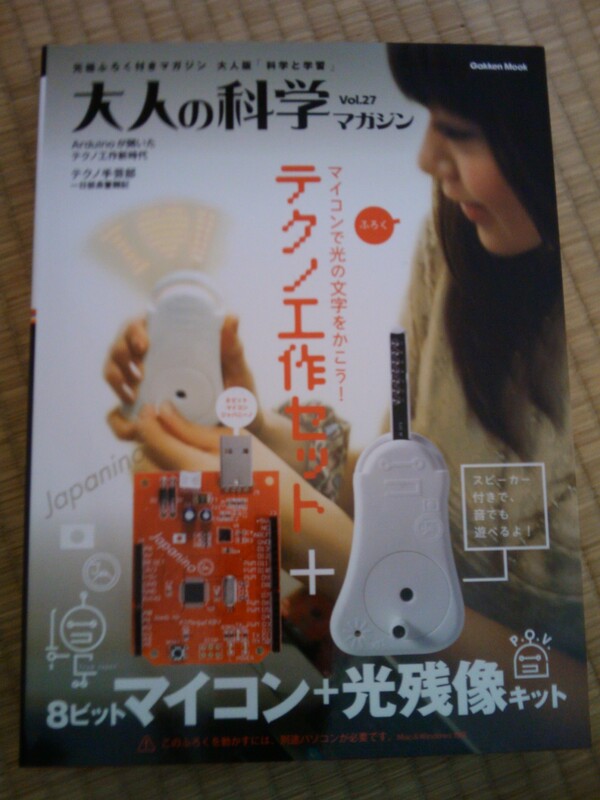 “Otona no Kagaku” is magazine that comes with some kind of sience related device inside that you can put together. There were all kinds of projects from synthesizers to airplanes, all sorts of fun. Kids today are so lucky, I wish I had a magazine like that when I was a kid. 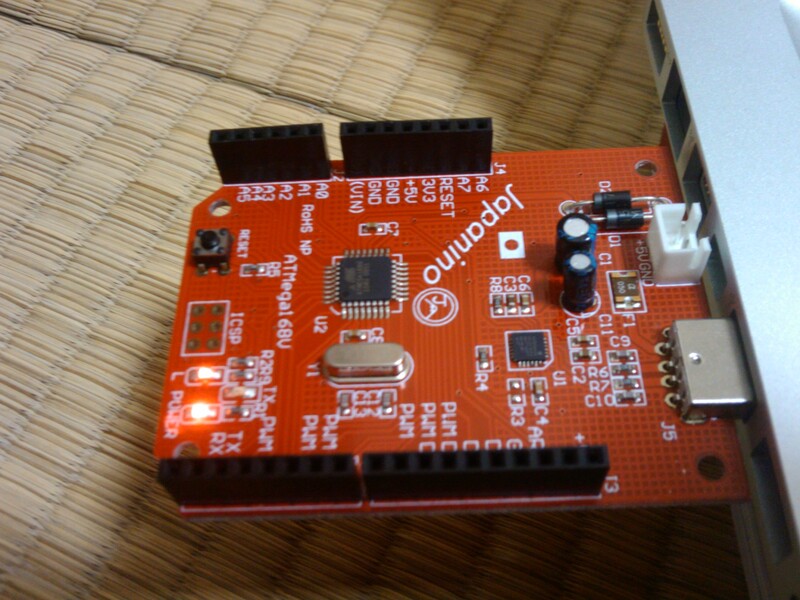 Anyway I’m too old for most of them to be interesting but one of them came with an Arduino board (branded as “Japanino”). Since the magazine cost about as much as a new pre-assembled Arduino + shipping I decided to buy it. The magazine is filled with a bunch of projects other than the one on the cover and explains how to go about doing them. It’s amazing all the cool things people are doing with the Arduino. 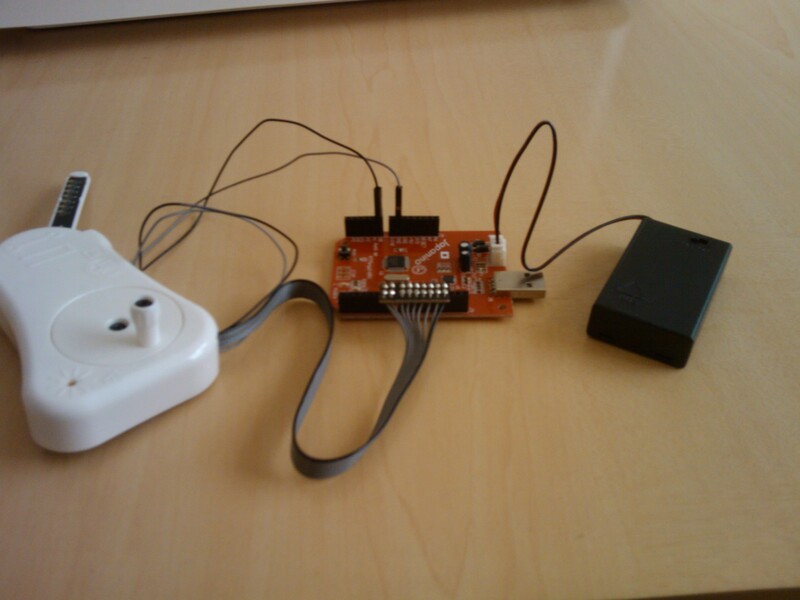 One guy uses an array of Arduinos to electricute himself in the face it seems. To each his own I guess. The Persistence of Vision project was really simple to set up. Just a few screws and the website had all the software you needed already. Here’s what the finished product looks like. The IDE is really simple. It’s amazing how low the bar is to get code onto these things. Way back when (circa 2005) I still had to build a cross-compiler environment. The language is like a C version of Processing, which is really intuitive and gets rid of having to write a boiler-plate event-loop in the main function. Now I’m thinking about what to do next. At work I’ve been experimenting with a presence system based on bluetooth which automatically locks the computer when I’m out of range. Unfortunately Bluetooth has a pretty long range. I wonder if there’s any NFC shields for the Arduino. It’d be pretty cool if you could use your phone as a smart-card via NFC.